There is something very human about wanting to know the current phase of the moon. We have been influenced by it for centuries and even though we now fully understand, and have visited, the moon, we are still enthralled by it. Of course, some of you just want to know what phase it is for more practical reasons, but for most of us it is just a fascination. Watchmakers have also been obsessed by the passing phases of the moon since almost as long as watches have existed. And watches that contain a moon phase complication are often very much out of reach of the average person. At least all the ones I have seen listed on other watch blogs. So, I thought I would cover a whole range of moon phase watches in this blog – from the very affordable and practical, to the obscenely expensive and most likely untouchable. They are ordered from cheapest to most expensive, so the biggest price shock comes at the end! Practicality is the name of the game with this watch from Casio. And it screams Casio from the very first glance. And a lot more than I have time to tell you. It’s the ultimate fisherman’s buddy, which is why it’s focused on the moon. 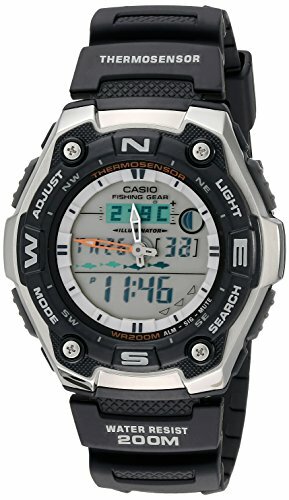 Of course, if you need other functions, including the moon phases, Casio has more than enough models to choose from. I know I might cop some flack for this particular watch as it does not really display accurate moon phases. It functions instead as an AM/PM indicator – so more sun in the day, more moon at night. 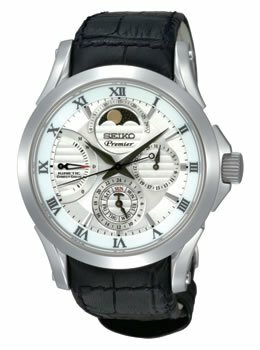 However, I know many of you are just looking for a moon phase watch that has “the look” and not necessarily the price tag of those expensive and completely functional moon phase watches. This one from Peugot is a bargain at under 100 dollars, but you do get what you pay for. The case is plated 14k gold and the band is leather, so that is a plus. However, it only has a Japanese quartz movement. Having said all that, if you like the look of this watch, or any of the other colors in the range, it’s a great buy. The first of the functioning moon phase watches is a Chinese brand that seems to be making a name for themselves. 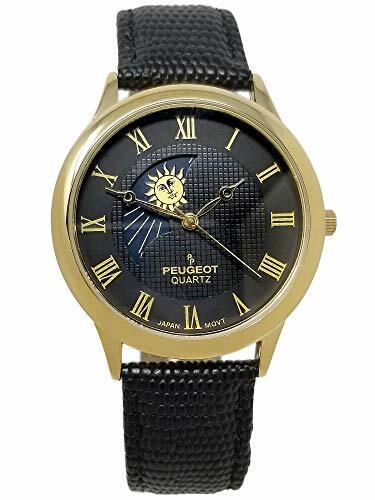 They are using some quality parts at affordable prices (a few hundred dollars) including a Japanese Miyoto automatic movement and sapphire crystal. 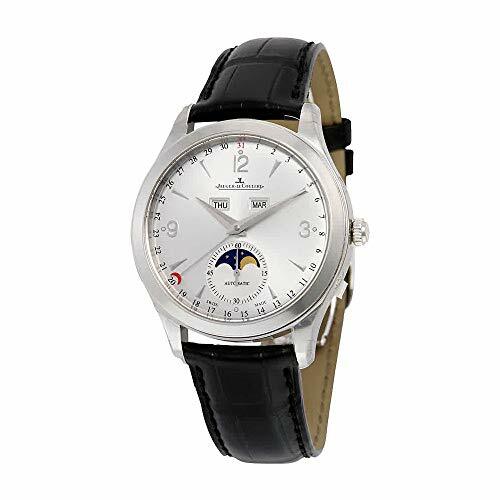 It has a range of sub-dial displays including – moon phase, 24hr time, day/date/month and a power reserve indicator. If you can get past the “Chinese Made” it’s a decent buy. 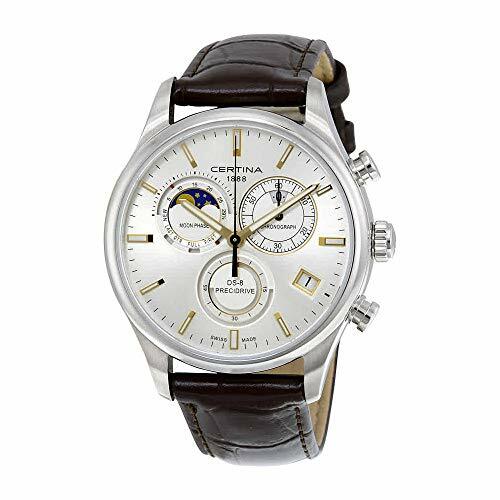 Perhaps one of the best buys on this list is this Swiss Made classic from Frederique Constant based in Geneva. 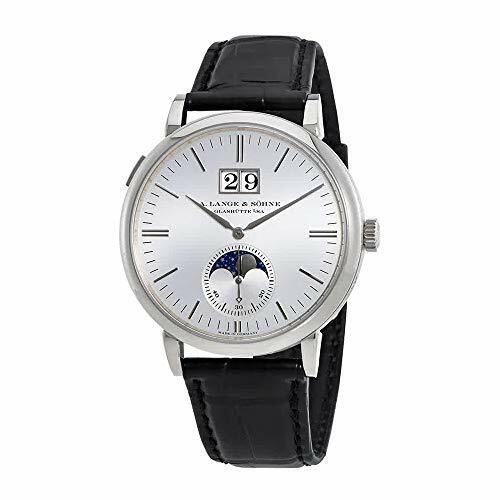 It has all the hallmarks of a clean and simple moon phase watch – white dial, roman numerals, thin black hands and alligator leather strap. Additionally, it also has day and date sub-dials and a clean sapphire crystal to keep it scratch-free. The only thing that they have really saved money on in this watch is the movement, which is Quartz, but at this price it’s a fair compromise. Certina is not a brand most people are familiar with, but I have been wearing one for over a decade. They are a mid-range Swiss brand that often does not get the exposure outside Switzerland. 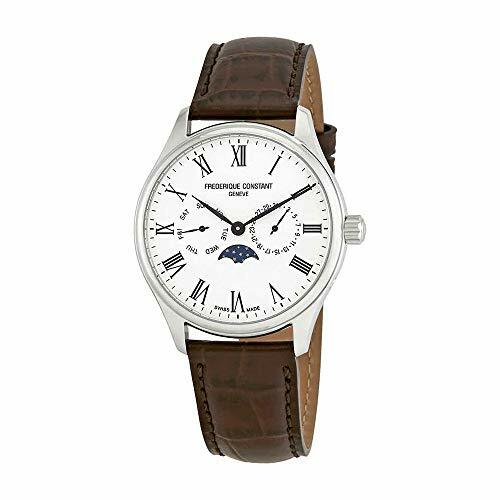 Their take on the moon phase watch has many of the classic elements – clean dial, multiple sub-dials, round silver case and a stylish alligator leather band. However, where they have deviated is the large aviator style chronograph buttons and the rectangular gold lined hour markers and date window at 4 o’clock. The movement at this price level is again a Swiss made quartz, but they have included a clear sapphire crystal which is great to see on such a affordable watch. Seiko seem to have their hand in all the pies, even when you least expect it. When researching moon phase watches, I did not expect they would have one – as it is often the realm of expensive Swiss manufacturers. But lo and behold, the SRX003. 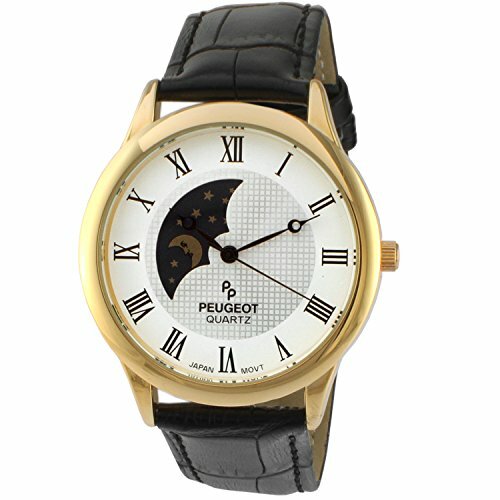 It is typically moon phase classic in it’s design with 4 sub-dials and roman numerals for the hour markers. The hands are also classically black and sword shaped. The primarily white dial and black aligator leather strap are also very dressy and suit the watch to a T.
Like most moon phase watches, it’s not cheap at around one thousand dollars, but it has a kinetic Quartz movement (solar powered – no battery changing) and sapphire crystal, so you get what you pay for in that regard. Orient know how to make quality time pieces and their range of watches is breath taking. Their Orient Star collection sits on the slightly more expensive end of this list, but what they offer is worth the price. 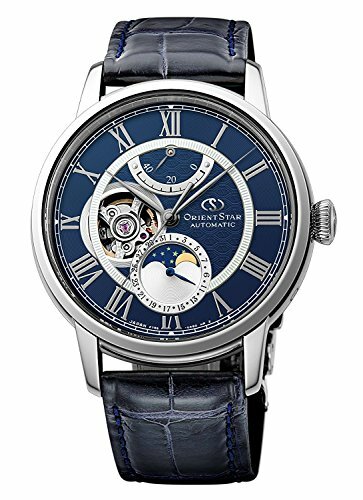 The combination of a classic style watch, a skeleton display at 9 o’clock, a moon phase indicator and a stunning blue background give this watch a very unique look. They have also added a very “pilot style” crown which is not often seen, but adds a touch of class I really like. Another of Orient’s best pieces is the Sun and Moon, in this case, version 2. 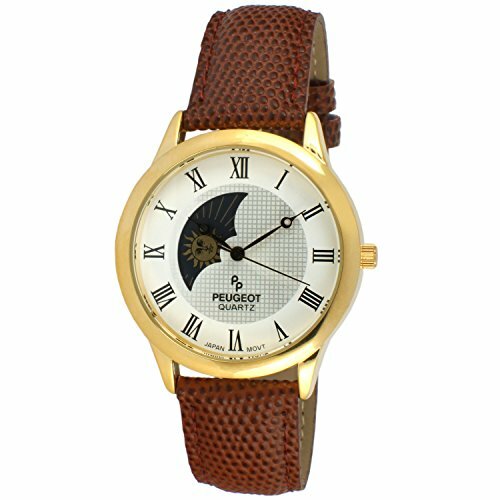 It is a stunning watch with intricate details that just keep on coming. From the recessed sub-dials, including the sun/moon phase at 9-11 o’clock, and the wide date window below that, Orient have put a lot of design effort into this watch. 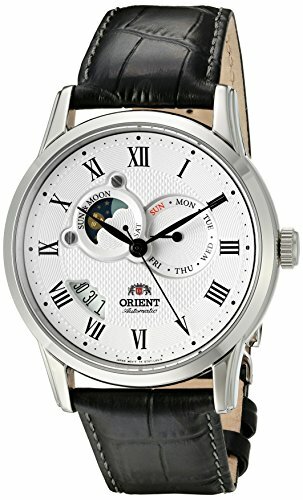 Orient have also added an automatic movement to this watch, along with a Sapphire crystal and display back. Only adding to the worth of this stylish watch in my opinion. Especially when we are talking just a few hundred dollars for this watch, in most cases. Omega are one of the most well known watch brands after Rolex. And for good reason. They make stunning, extremely high-quality watches that have been decorating the wrists of the rich and famous for decades. This particular version of the infamous Speedmaster features a moon phase sub-dial at 12 o’clock. And of course the expected 3 sub-dial chronometer and tachymeter bezel we know and love. With a watch making history dating back to 1833 in Switzerland’s time-keeping region, Jaeger LeCoultre have been crafting luxury timepieces for nearly two centuries. This particular watch is a sheer piece of elegance with a subtle day/month window as well as a stunning moon phase sub-dial at 6 o’clock. The hour markers alternate between arrows and arabic numerals, but are subtle and refined. And there is a rather unique date display around the case edge instead of minutes. This is a watch for someone who values the handmade quality of a luxury Swiss made timepiece that only they will own. Lange & Sohne are one of the original watchmakers hailing from Germany’s watchmaking town of Glasshütte in Saxon. This watch is heading into the stratosphere with prices of tens of thousands, this white gold cased watch is something of a luxury timepiece. 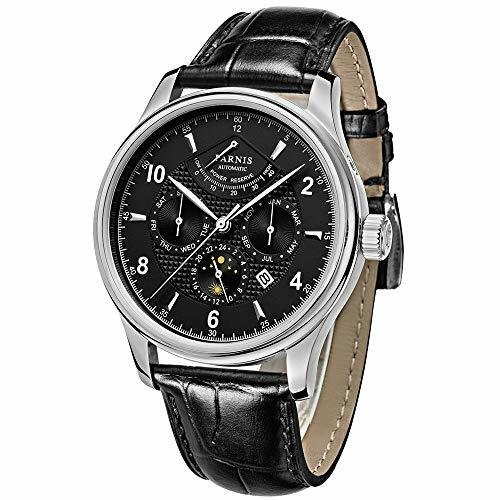 It has an automatic movement with 72 hour reserve, and a two window date.